There is something therapeutic about picking up a spoon and breaking through that beautiful glassy caramelized sugar to reach the soft rich vanilla custard of a crème brûlée. Yes, it's an elegant French dessert with a classy French title but I don't let that scare me from making it at home. It's really quite simple to prepare; although I must confess burning the sugar topping to get just the right caramel hardness can be a bit tricky. Still, this can be overcome with practice. 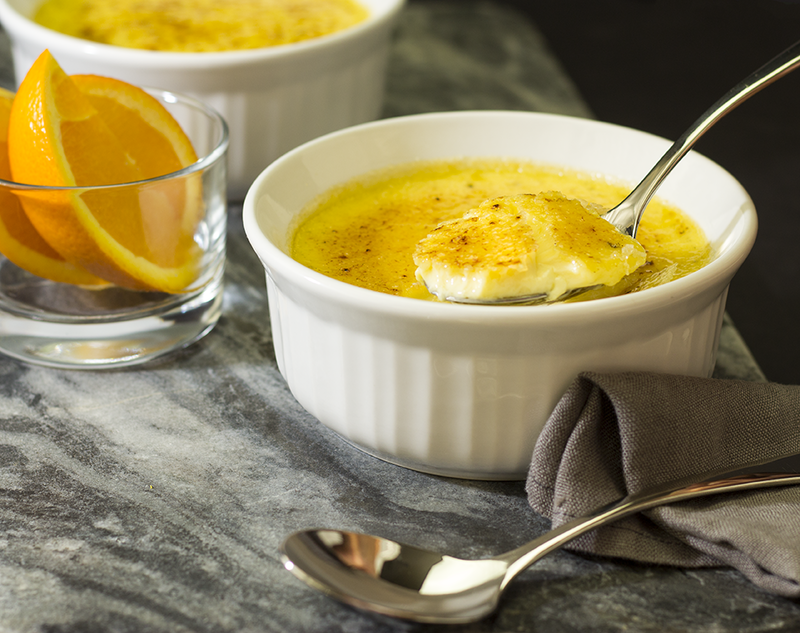 Crème brûlée is a rich vanilla custard to which, in this recipe, I've added orange flavor. Yields 32 ounces. Add the vanilla beans and pod, the divided sugar and pinch of salt to the heavy cream. Gently stir with spatula and bring to a low boil. As the heavy cream mixture approaches a boil, gently whisk the egg yolks until the eggs show a light color. Add a small amount of the hot heavy cream to the eggs and whisk. Be careful not to add too much which would cook the eggs. Blend in a little more of the heavy cream, then slowly add the remaining cream. Add the orange flavor extract. Blend. Pour the mixture through a strainer into a pitcher or bowl that has spout or wide lip for pouring. Add the zest of an orange and stir. Pour the mixture into the ramekins leaving about 3/4" to 1" at the top. Place the ramekins in a glass or metal tray and then put it in the oven on the middle rack. Pour the boiled water into the tray to at least half the height of the ramekins. *For deep dish ramekins, such as the one shown, bake for 40-45 minutes. If you are using wide 6-8" ramekins, bake for about 30 minutes but at 300 degrees. The custard is ready if it jiggles when shaken. Be careful not to overcook. Using a spatula and oven mittens or kitchen towel, remove ramekins from the water bath. Place the custard in the refrigerator for at least three hours. Remove custards from refrigerator and allow them to reach room temperature. Using the reserve sugar, spread about two or more tablespoons on the custard. Gently shake or move ramekin in a circular motion to evenly and completely spread the sugar over the top. Tip the ramekin to discard any extra sugar. Too little sugar will give you a thin layer. **There are two methods that can be used to caramelize the sugar. However, this method adds to the cooking of the entire crème brûlée. The caramelizing also gives dark brown blisters. Should you choose this method, just be sure to watch the caramelizing closely and be sure to turn the ramekin half way through the process. So please do come back and share your experience.